An evocative account by New York Times reporter Johnson of his participation in the grueling Badwater Ultramarathon, describing the race itself and his reasons for running it. After Johnson’s brother Gary committed suicide in 1997, Johnson began running again. Unlike Gary, he had never been much of an athlete, but as he neared 40 he found himself thinking more and more about his brother’s death and his own mortality. 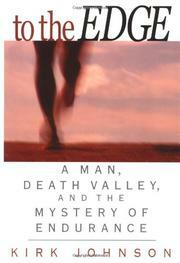 Assigned to the Times sports desk, he interviewed Liz Smith, who was about to run some race in Death Valley. When Smith told him about her upcoming race (the Badwater) and about other ultramarathons, he became intrigued and eventually decided to run the Badwater himself. Like all ultramarathons, Badwater is about endurance, not speed. The course (135 miles long) begins in Death Valley (282 feet below sea level) and finishes in the Sierra Nevada (at the trail-head to Mount Whitney). It takes place in mid-July, and a successful competitor must finish the course in less than 60 hours. Thinking that running the race might help him to understand some of the questions that troubled him, Johnson took a year’s leave to prepare himself. He learned all that he could about the race and its history, and he interviewed other Badwater competitors—such as the handicapped Vietnam vet Dan Jensen, the legendary Ulrich (who once pulled a rickshaw across Death Valley), and Mick Justin (who advised him that, to finish Badwater, “you just have to want it badly enough”). With his two siblings in charge of supplies, Johnson set off on the 1999 race. Blisters slowed him down, exhaustion brought on terrifying hallucinations, the heat was lethal, but the author endured, choosing to go on rather than give up. A nice job: Like all good sports narratives, this is more about meeting challenges than winning titles.